What is it they say, lads? “Fake it ‘til you make it”? Show the other gym bunnies who’s boss with this tee from sportswear brand Reigning Champ that does all the talking, no matter the actual firepower of your guns. If the effects of December are showing on your bonce as well as your bank account, tap up Lab Series’ new age-defying eye cream. Designed to rev up your skin’s bounce-back to booze (among other things), it’s worth stocking up before Dry January is over. Sound the brand-spanking-new label klaxon. Ourver – ‘Our Version’, in case you were wondering – is the brainchild of ex-Saint Laurent and DKNY designer, Paul Keetley. With an emphasis on premium-quality fabrics and an ethical approach to manufacturing, the result is everyday pieces that have been crafted in England, like this aptly named ‘Essential’ chambray shirt. Following the success of the pair’s first hook up in 2016, British brogue king Grenson has once again hopped into bed with US sports tsar New Balance. The collection of really quite formal-looking sneakers is constructed using the Northampton brand’s full-grain Italian calf leathers. So it goes without saying they’re far too nice to wear in the gym. Adding to an already impressive list of partnerships that has included the likes of Christopher Raeburn, Ami and Maison Kitsune, luggage brand Eastpak has bagged another banging collaboration, this time with brilliant Belgian designer Raf Simons. If we had to pick just one reason why we hope the seventies trend never dies (aside from the Lazarus-like return of corduroy), it’s being able to wear tracksuit pieces, like these side-stripe trousers from H&M, out of the house. We’re going to go out on a limb and guess that your bank balance is looking a bit droopy right now. Don’t panic. The new-season offering at BoohooMan is on point and on budget. Take this shirt, which checks (apologies) all kinds of trend boxes. You only need to look at our coverage from Fashion Week to see that hoodies were ubiquitous on the street. If your style is a little more polished, get in on the action with this unstructured blazer which, even with a grey marl pullover underneath, will still look more smart than slovenly. British-based brand Surf Perimeters makes the kind of off-duty jersey sweats that you can get away with regardless of how well you can ride a wave. Made from organic cotton and dyed using environmentally-friendly processes, you get to don a smug smile at the same time. There are few things we at FashionBeans enjoy more than a charity initiative that not only leaves us with that warm, fuzzy feeling of having done something good, but also makes our feet look good. So imagine our excitement over this offer from Asics: donate £5 to Right to Play – an organisation that uses sport to educate and empower children in disadvantaged communities – and you’ll get 20 per cent off your new kicks. A coat you could survive a polar vortex in is never a bad investment. Though we may be on the home stretch of the chilly season, this cosy-AF puffer from Scandinavian brand Weekday will still be high on our hygge list next year. John Waters once said if someone doesn’t read, don’t sleep with them. So even if you have no plans on picking up a book, you should at least look like you might with this textured cardigan from Topman that’s nerdy in the best kind of way. Relaxed-leg jeans are, quite literally, big news. But if you’re still clinging to your skinnies, ease into the trend with a slim cut. This pair from 7 for All Mankind is made with a ‘C’ shape construction, which allows them to retain air inside, giving a good bit of breathing space for your balls. And, relax. Get in the mood for the next instalment of Fox’s smash hit anthology series American Crime Story with this blinging ring. Having already tackled the OJ Simpson case, they’re looking at the murder of Italian designer Gianni Versace, so expect a lot of gold and silk shirts to hit your screens soon. Peppered in between the ‘err, okay…’ and ‘OMG WTF! ?’ collections at Fashion Week are always a few gems. 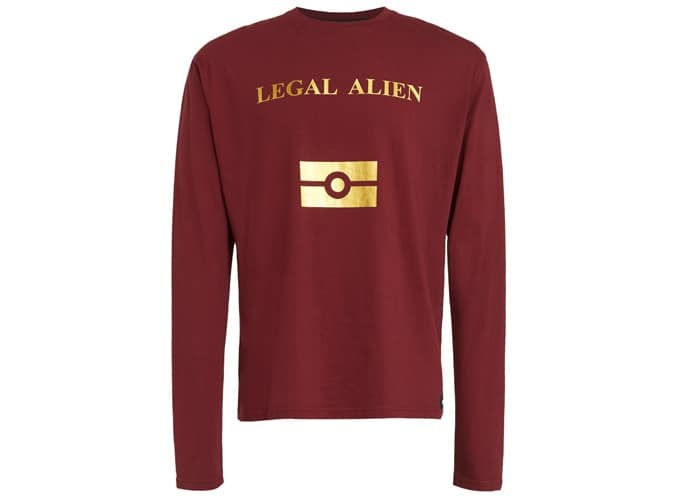 Some of this season’s standout pieces came from London designer Bobby Abley, who has produced an exclusive collection with Urban Outfitters that includes this passport-inspired ‘legal alien’ tee. As if we didn’t have enough to thank John Varvatos for (in his time at Calvin Klein, he inadvertently invented the world famous boxer brief), under his own label the US designer also produces killer fragrances that smell, well, much better than a pair of pants. With summer a distant memory (and no sign of it coming back anytime soon), chances are you’re feeling a bit pasty. Rather than reach for the bottle of industrial strength fence stain, pull on this tan tee from high-street hero River Island and let it work its magic on your complexion. If anyone knows how to make clothes look good, it’s a model. Enter Jodhi Meares and her brand The Upside. Founded in New York, its latest colourful jacket, fittingly named Belair, wouldn’t look out of place on the Fresh Prince himself. The trend for tucking has put waistbands back on the wardrobe agenda, so make sure yours is covered. This week we’re particularly taken with this sleek streetwear-leaning belt from Adidas offshoot Y-3.